Spring return handle/lever automatically close or open the ball valve through a spring mounted in the handle when handle is released by operator . This means that when operator opens the valve with the lever for the product to flow , he has to hold the lever in the open position if he leaves the handle the valve will automatically closed/shut off & flow will stop . Spring return “Deadman” handles will help you meet OSHA requirements or plant specifications where a valve must return to the closed position after operation. Unlike a standard lever handle or Gear operator which will remain in the last position, our assemblies ensure that the handle will always spring return to its original, pre-designated starting position. These handles are available for retrofitting in the field. Deadman lever is a special lever along with suitable mounting arrangement designed for most quarter turn valve types . 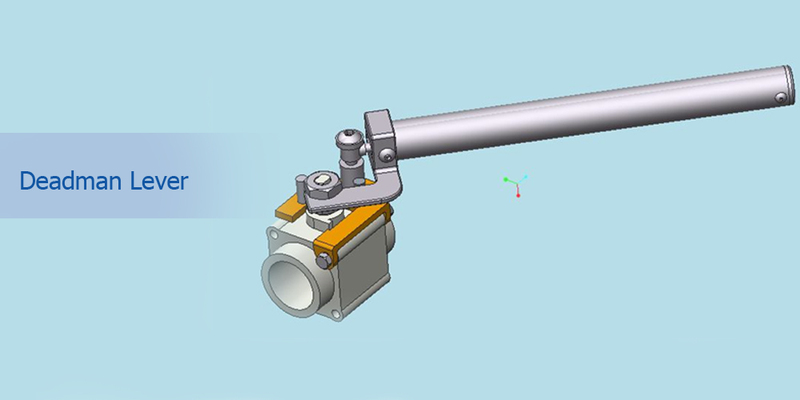 Deadman lever has customized design based on the Maximum torque input for valves.